Environmental Benefits: Trees alter the environment in which we live by moderating climate, improving air quality, reducing storm water runoff, and harboring wildlife. Local climates are moderated from extreme sun, wind, and rain. The shade and wind-breaking qualities that trees provide benefit everyone from the individual taking shelter from a hot summer day to entire cities. Households with shade trees could spend less on cooling costs in the summer. Radiant energy from the sun is absorbed or deflected by leaves on deciduous trees in the summer and is only filtered by branches of deciduous trees in winter. The larger the tree, the greater the cooling effect. Wind speed and direction is affected by trees. The more compact the foliage on the tree or group of trees, the more effective the windbreak. Rainfall, sleet, and hail are absorbed or slowed by trees, providing some protection for people, pets, and buildings. Trees intercept water, store some of it, and reduce storm water runoff. Air quality is improved through the use of trees, shrubs, and turf. Leaves help filter the air we breathe by removing dust and other particulates. Rain then washes the pollutants to the ground. Leaves absorb the greenhouse gas carbon dioxide during photosynthesis and store carbon as growth. Leaves also absorb other air pollutants – such as ozone, carbon monoxide, and sulfur dioxide – and release oxygen. Increased Property Values: Property values of landscaped homes can be 5 to 20 percent higher than those of non-landscaped homes. The economic benefits of trees are both direct and indirect. Direct economic benefits are usually associated with energy costs. Air-conditioning costs are lower in a tree-shaded home. Heating costs are reduced when a home has a windbreak. Trees increase in value as they grow. Trees, as part of a well maintained landscape, can add value to your home. Social Benefits: Human response to trees goes well beyond simply observing their beauty. We feel serene, peaceful, restful, and tranquil in a grove of trees. We are “at home” there. The calming effect of nearby trees and urban greening can significantly reduce workplace stress levels and fatigue, calm traffic noise, and even decrease the recovery time needed after surgery. Because of their potential for long life, trees are frequently planted as living memorials. We often become personally attached to trees that we, or those we love, have planted. The strong tie between people and trees is often evident when community residents speak out against the removal of trees to widen streets or rally to save a particularly large or historic tree. Wildlife Habitat: Wildlife use trees for food, shelter, nesting, and mating. These habitats support the incredible variety of living things on the planet, known as biodiversity. By protecting trees, we also save all the other plants and animals they shelter. Benefits of Shrubs: Many people go to great lengths to try and conserve energy as a result of tight budgets or environmental awareness. However, more often than not, these energy savings are a result of actions taken inside of the home, such as using energy-saving light bulbs or washing clothes during off-peak times. Many people don’t realize that outdoor practices, such as strategically planting a shrub on your property, can actually result in energy savings too! Planting the right shrub in the right place can help cool your home in the summer and lower your energy bills, while also adding beauty, privacy and even wildlife habitat to your backyard. Shade can act as a natural air conditioner and can be easily created by strategically planting shrubs around your property. By planting larger deciduous shrubs along the west and east facing walls of your home, you can create both early morning and late afternoon shade in the summer, which in turn, will allow you to save money by turning down your air conditioner. In the winter, your shrubs will have dropped their leaves, allowing radiation from the sun to pass through and heat your home. Another way to effectively save on energy costs is to plant shrubs around your air conditioner. The shade from these shrubs will increase the energy efficiency of the unit by keeping it cooler during the hot summer months. The same shrubs can also shield A/C units from cold winds and snow in the winter. However, always remember that when planting around an A/C unit, you want to leave some room for air flow to prevent clogging vents and damage to the unit (which could result increased costs for you). In addition to energy conservation, shrubs can also provide food and shelter to a variety of beneficial backyard wildlife, including songbirds, butterflies and honeybees. 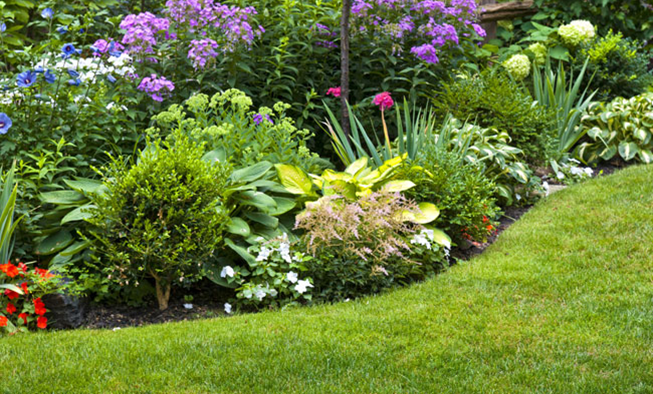 All in all, shrubs are pretty awesome – they save you money and help to beautify your yard! Start creating your own energy-saving backyard oasis today by purchasing some native shrubs.